Yuri Malenchenko is a Colonel in the Russian Air Force and a Test Cosmonaut-Instructor at the Gagarin Cosmonaut Training Center. He is one of the most experienced space fliers with four previous long duration missions to the Mir Space Station and the International Space Station as well as a Space Shuttle flight. Malenchenko was born on December 22, 1961 in Khrushchev, Ukrainian SSR. He attended Kharkov Higher Military Pilot School from which he graduated with a a diploma of pilot engineer in 1983. Afterwards, he served in the guards fighter aviation regiment of the Odessa military region as a pilot, master pilot and commander of the regiment. A third class military pilot, Malenchenko logged over 830 flying hours and made more than 150 parachute jumps. He was enlisted in the Cosmonaut Training Center detachment in 1987 and completed two years of general training and evaluations at the Gagarin Cosmonaut Training Center. Malenchenko received his qualification as a Test Cosmonaut in 1989 and entered general training under the Mir Space Station program. While in general training, Malenchenko attended Zhukovsky Air-Force Engineering Academy to become a specialist in the field of Operational and Tactical Engineering, Flight Vehicles. In 1993, Malenchenko trained as a backup crew member for the EO-14 mission to the Mir Orbital Complex before transitioning to the backup commander position for EO-15. In 1994, he entered flight-specific training for his first prime crew assignment as Commander of Soyuz TM-19 and Mir EO-16. Yuri Malenchenko launched aboard Soyuz TM-19 on July 1, 1994 together with Talgat Musabayev in a rare all-rookie Soyuz mission of just two crew members because the third crew member, Gennady Strekalov, was cut from the mission to fill his spot with supplies for Mir after the cancelation of one Progress resupply mission. The two crew members docked to Mir two days later and began a busy schedule of medical and materials science experiments. 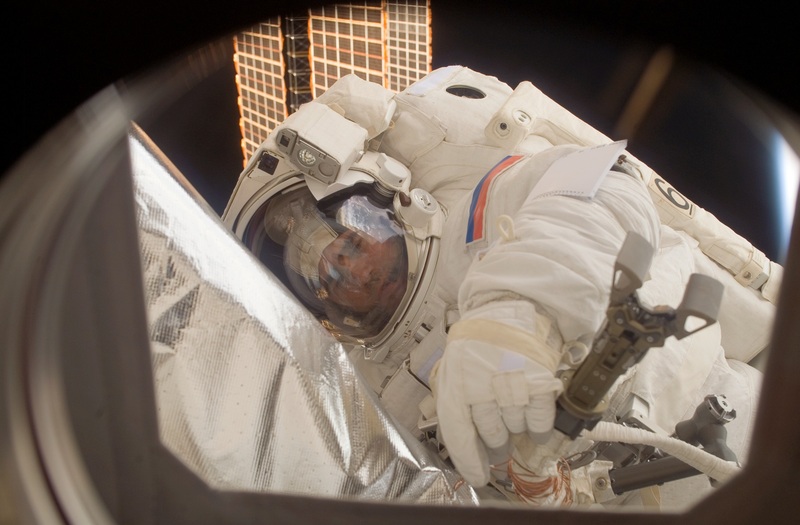 They conducted a pair of spacewalks to repair external insulation for a total of 11 hours and 7 minutes and their mission saw the first ever manual docking of a Progress supply ship after the automated navigation system experienced problems. One day prior to their return, the two crew members completed an undocking – re-docking exercise to check out the KURS navigation system that had experienced problems on Soyuz and Progress missions. The tenth Expedition to Mir ended with a successful landing on November 4, 1994. Malenchenko logged 125 days and 23 hours in space on his first flight. Returning from space, Malenchenko went through the usual post-flight operations before entering general training operations again to keep up proficiency on Soyuz spacecraft operations. He then joined the efforts of the International Space Station program that began operational activities well ahead of the first module launch. Malenchenko spent six months in 1996 working as a coordinator at Mission Control Houston before entering two years of training and familiarization with systems and operations associated with the International Space Station. Passing his ISS training, Malenchenko transitioned to Space Shuttle training operations from 1998 to 2000 for ISS Assembly Mission 2A/2B. Space Shuttle Atlantis blasted off with a crew of seven on September 8, 2000 and linked up with the Space Station two days after launch. The main purpose of the mission was the delivery of supplies to the Station using a double SpaceHab cargo module installed in the Shuttle’s payload bay. 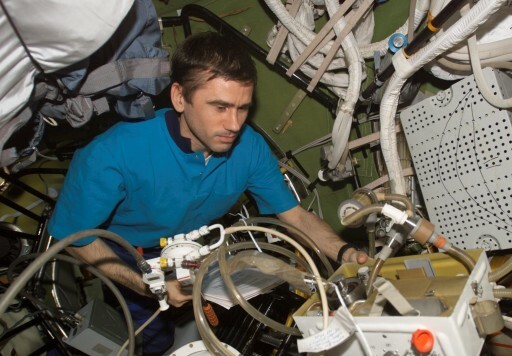 Malenchenko was joined by fellow Cosmonaut Boris Morukow on the flight and the two had a busy schedule dedicated to the preparation of the Zvezda Service Module for the first long-duration crew taking up residence on ISS later that year. They also transferred cargo from the Progress M1-3 cargo vehicle to Zvezda. 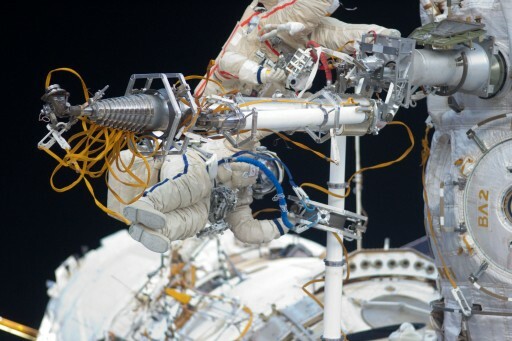 Yuri Malenchenko and Astronaut Ed Lu conducted a six-hour 14-minute spacewalk to route nine power, data and communications cables between the large Russian modules Zarya and Zvezda. They also set up a magnetometer, in use as a navigation sensor. The STS-106 mission had a duration of 11 days and 19 hours and ended with a successful landing at the Kennedy Space Center. 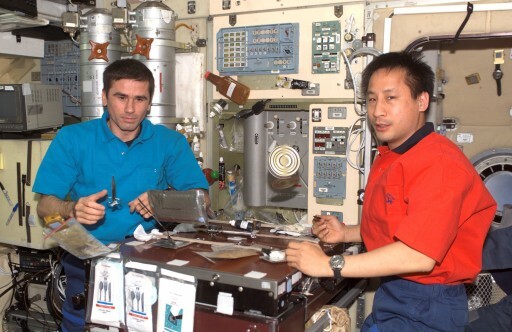 Returning to Russia, Malenchenko was assigned to the commander position of the ISS Expedition 7 prime crew joined by Flight Engineers Ed Lu and Aleksandr Kaleri who joined the crew in 2002. ISS-7 was expected to launch aboard Space Shuttle Atlantis on mission STS-114 in March 2003, but the Columbia accident caused all Shuttle flights to be grounded requiring the ISS flight schedule to be realigned to use Soyuz missions only. As a result, the crew was downsized and Kaleri transferred to the backup crew. Malenchenko and Lu began final training operations on the Soyuz-TMA vehicle in February for an April launch date. Soyuz TMA-2 lifted off from the Baikonur Cosmodrome on April 25, 2003 and arrived at ISS two days later for a six-month mission during which the two crew members conducted only 15 different experiments given the reduction of crew size and the ongoing ISS assembly and resupply operations. Two Progress flights were supported by the crew, moving delivered supplies to ISS and loading the Progress with trash for re-entry. Malenchenko and Lu were joined by a third person in space, Yang Liwei who launched aboard the Chinese Long March 2F rocket and Shenzhou 5 spacecraft, marking China’s first crewed space flight. Handing ISS over to the Expedition 8 crew of Aleksandr Kaleri and Michael Foale, Malenchenko and Lu, joined by short-duration crew member Pedro Duque, made a successful return to Earth on October 28. The Expedition 7 mission added 184 days and 23 hours to Malenchenko’s spaceflight record. 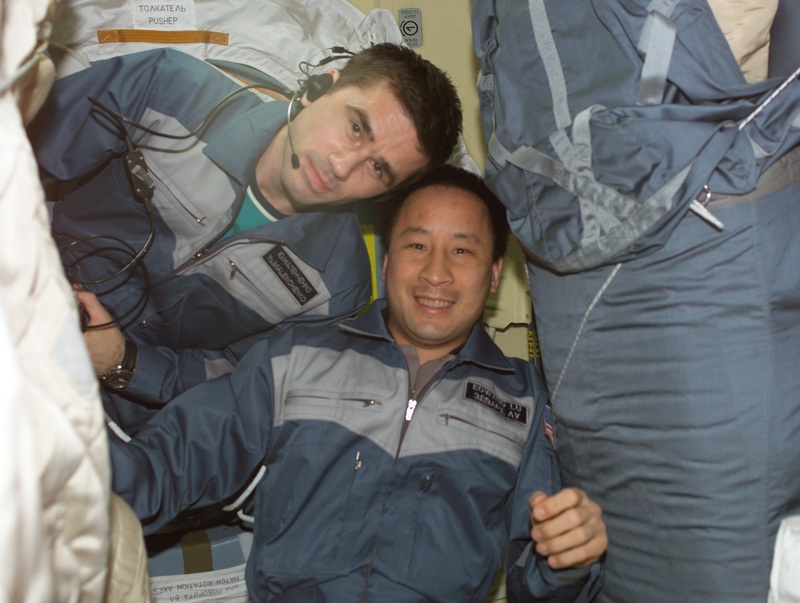 Back on Earth, Malenchenko worked as a Cosmonaut instructor at the Gagarin Cosmonaut Training Center before training as part of the ISS Expedition 14 backup crew followed by the transition to the Expedition 16 prime crew together with NASA’s Peggy Whitson and four Astronauts from NASA and ESA that were to be shuffled by the Space Shuttle. Soyuz TMA-11 lifted off on October 10, 2007 bringing Malenchenko and Expedition 16 commander Whitson to ISS along with spaceflight participant Sheikh Muszaphar who landed with Oleg Kotov and Fyodor Yurchikhin after the handover between ISS Expedition 15/16 was complete. Clay Anderson joined the crew for the first portion of the Expedition. In late October, the Station was visited by Space Shuttle Discovery and a crew of seven, delivering to ISS the Harmony module that was installed robotically followed by outfitting of the module as part of a total of four EVAs that also accomplished the relocation of the P6 truss segment from a position attached to Z1 over to its permanent spot as the outermost segment on the port truss assembly of the Station. Discovery remained docked for nearly 11 days, also serving as a crew rotation flight, bringing Anderson back to Earth and leaving Dan Tani on ISS for three and a half months. In these three and a half months, the three crew members focused on science and the continuation of ISS reconfigurations. Venturing outside the hatches of ISS, Malenchenko and Whitson performed a 6-hour 55-minute EVA to prepare Pressurized Mating Adapter 2 for a robotic relocation to the Harmony module that was completed a few days later. Harmony, attached to a temporary location on the Destiny lab, was moved to the front of ISS shortly thereafter to restore the forward docking port. Whitson and Tani completed the second third EVAs of Expedition 16 in November to finish the outfitting of Harmony in its permanent position. Tani and Whitson again stepped outside in December for the 100th EVA in support of Station Assembly and Maintenance, performing inspections on the S4 Solar Alpha Rotary Joint followed by another EVA in January 2008 to replace a motor within the S4 SARJ to restore functionality. Space Shuttle Atlantis arrived at the Station on February 9 carrying to ISS the 12 metric-ton Columbus module, Europe’s orbital laboratory module. After Columbus was installed to Node 2 robotically, three EVAs were performed to outfit the module, install external experiment payloads and complete other ISS outfitting such as the installation of the P1 Nitrogen Tank Assembly and the Station-to-Shuttle Power Transfer System. ESA Astronaut Leopold Eyharts replaced Dan Tani to stay back on ISS to complete the internal outfitting of the Columbus module. Atlantis returned to Earth on February 20 after 12 and a half days in orbit. The next laboratory module to be attached to Node 2 arrived in March aboard Space Shuttle Endeavour. The Japanese Kibo module was installed robotically and the mission included five EVAs for the outfitting of Kibo and the assembly of the Dextre robot that was also delivered by Endeavour. Eyharts was replaced by Garret Reisman when Endeavour departed after a docked mission of nearly 12 days, becoming the first Shuttle mission to use the Station to Shuttle Power Transfer System. After Endeavour departed, the next vehicle to arrive at ISS was the first Automated Transfer Vehicle, Joules Verne. Docking to the Zvezda module, ATV was monitored by Yuri Malenchenko. He was also in charge of hatch opening to the first ATV to deliver supplies to the Space Station. Soyuz TMA-12 arrived at ISS on April 10 bringing the next long-duration crew of Sergei Volkov and Oleg Kononenko to ISS along with the first Korean Astronaut Yi So-Yeon who returned to Earth with Yuri Malenchenko and Peggy Whitson. The three crew members were not treated to a gentle return to Earth – instead, their Soyuz went through a ballistic re-entry caused by a botched separation of the Soyuz Service Module due to one of five pyrotechnic bolts malfunctioning. The additional G-loads encountered by the crew during Entry caused some minor injuries such as bruises. A similar problem had occurred on the Soyuz TMA-10 mission. Malenchenko’s fourth spaceflight was 191 days and 19 hours in duration. In 2009/10, Malenchenko transferred to the CTC NII Cosmonaut Detachment, continuing to serve as a Cosmonaut Instructor at the Gagarin Cosmonaut Training Center. 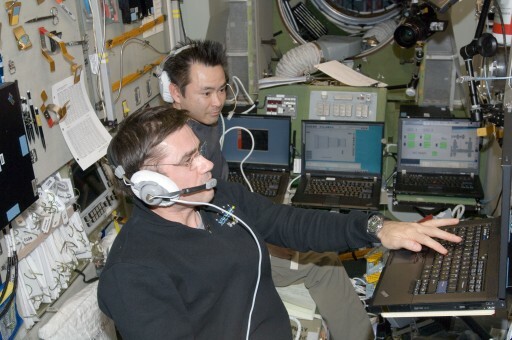 He was assigned to the backup crew of ISS Expedition 30/31 and the prime crew of Expedition 32/33 together with Aki Hoshide and Suni Williams. News of the crew’s selection emerged in January, but official confirmation from NASA did not come until July followed by confirmation from the Russian Interdepartmental Commission. In August of 2010, Malenchenko participated in an airborne observation campaign for training in visual-instrumental observations for object observation and ecological monitoring. He completed survival training in January 2011 with two Russian Cosmonauts to prepare for the unlikely event of a Soyuz emergency landing in winter conditions. 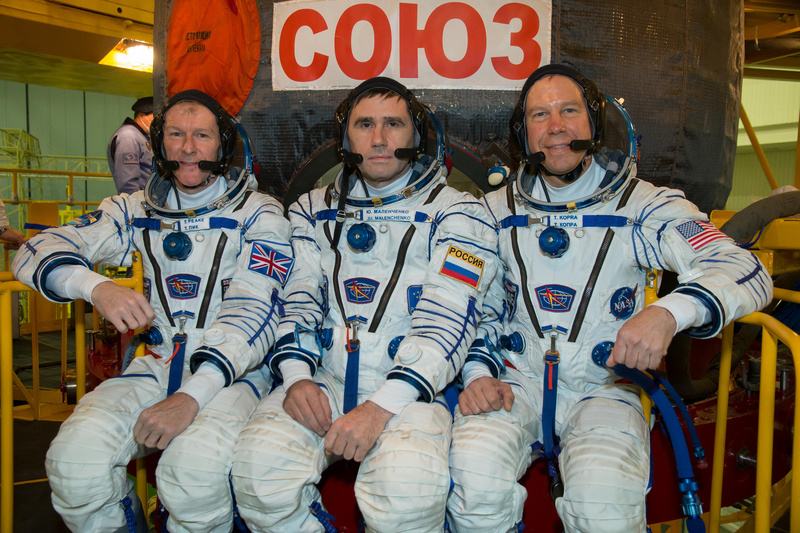 Malenchenko, Hoshide and Williams completed ISS training operations and final Soyuz exams in December 2011 to be ready as the backup crew for Soyuz TMA-03M that launched on December 21, allowing the three crew members to begin final training as part of their prime flight assignment. In June 2012, the three crew members completed final Soyuz and ISS training and exams, passing with excellent grades and being approved for flight on June 22 by the Interdepartmental Commission, clearing them to head to the launch site for final preparations for their half-year mission, Malenchenko’s fifth. Soyuz TMA-05M blasted off from Baikonur on July 15, 2012 and arrived at ISS two days later. 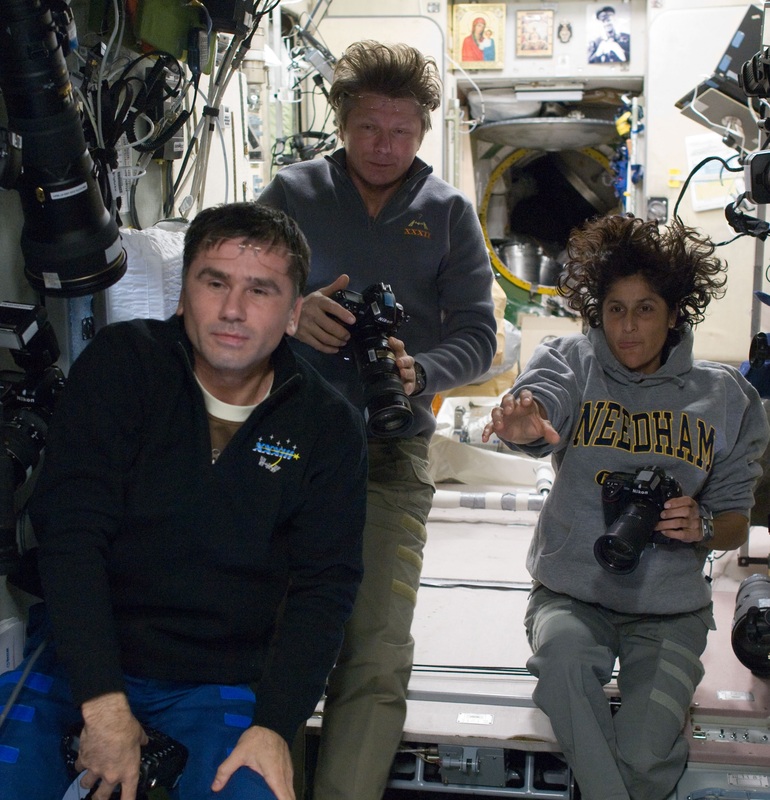 The three crew members joined Gennday Padalka, Joe Acaba and Sergei Revin aboard ISS for a mission primarily focused on science operations. In late July, ISS was joined by HTV-3 that launched from Japan on July 21, delivering internal and external payloads to the space station, including high-profile experiment payloads such as the Scan Testbed, the Aquatic Habitat and CubeSatellites. In late July, Progress M-15M conducted an undocking and re-docking maneuver to check out a new set of KURS rendezvous sensors. A short time later, on August 1, Progress M-16M docked to the Russian Segment to keep up a steady chain of supplies heading to ISS. This Progress was the first craft to use an expedited four-orbit, six-hour rendezvous technique that would later become the standard rendezvous profile flown by the Progress and Soyuz fleets. 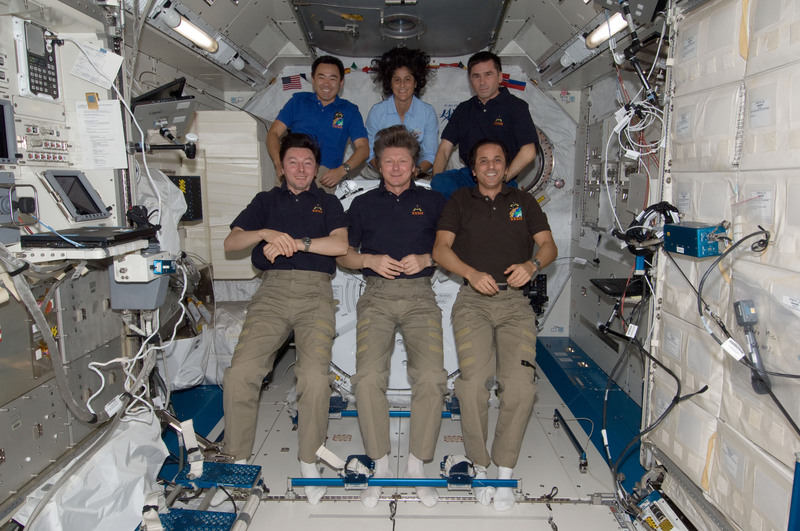 HTV-3 departed in mid-September. On August 20, Gennady Padalka and Yuri Malenchenko conducted an EVA to relocate the Strela 2 Boom from the Pirs to the Zarya module, release a small spherical satellite, install five MMOD panels on Zvezda and retrieve a Biorisk Experiment container. The spacewalk lasted for 5 hours and 51 minutes. Padalka, Revin and Acaba departed ISS in the late hours of September 12, 2012 for an overnight return to Earth, making a successful landing in the steppe of Kazakhstan. Transitioning to Expedition 33, Suni Williams assumed command of ISS for an extended period of three-crew operations. ATV-3 Edoardo Amaldi departed the Space Station on September 28 and in early October, the first regular Dragon cargo mission arrived at the Space Station. October also marked the first deployment of CubeSats from the International Space Station when the first five satellites were released into orbit using the Japanese robotic arm. Also, ISS tested laser communications with Russian ground stations. The crew welcomed Soyuz TMA-06M and Oleg Novitsky, Evgeny Tarelkin and Kevin Ford aboard ISS in late October followed by the arrival of a Progress spacecraft in early November and a spacewalk by Suni Williams and Aki Hoshide to reconfigure the Station’s photovoltaic cooling system. Malenchenko, Williams and Hoshide departed ISS on November 18 aboard their Soyuz spacecraft for a parachute-assisted landing in Kazakhstan in the early hours of the 19th, concluding mission of 126 days and 23 hours. 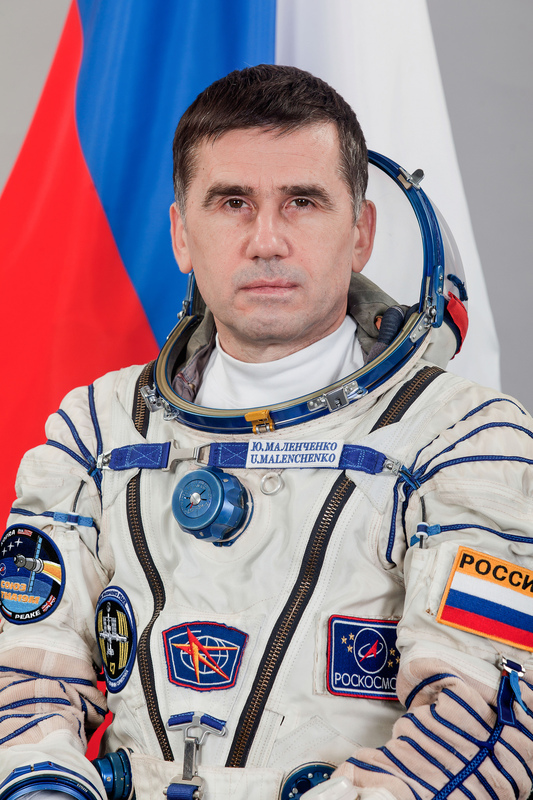 Malenchenko was announced as a prime crew member of ISS Expedition 46/47 in April 2014 and confirmed as Commander of Soyuz TMA-19M in December, to be joined by Tim Peake and Tim Kopra for the flight to ISS and a mission of seven months. Entering flight-specific training with his crew, Malenchenko went through ISS and Soyuz exercises as part of the backup crew assignment for Soyuz TMA-17M before the crew entered final training operations in the months leading up to their flight. Aboard ISS, Malenchenko will serve as Flight Engineer during Expedition 46 and transition to the commander role for Expedition 47. On his five previous missions, Yuri Malenchenko logged 641 days, 11 hours and 11 minutes in space including 30 hours and 5 minutes of EVA time in five spacewalks. Malenchenko is married to Ekaterina Dmitrieva, they have a daughter, Camilla, born in 2006. Yuri Malenchenko has a son, Dimitry, born in 1984 from a previous relationship. 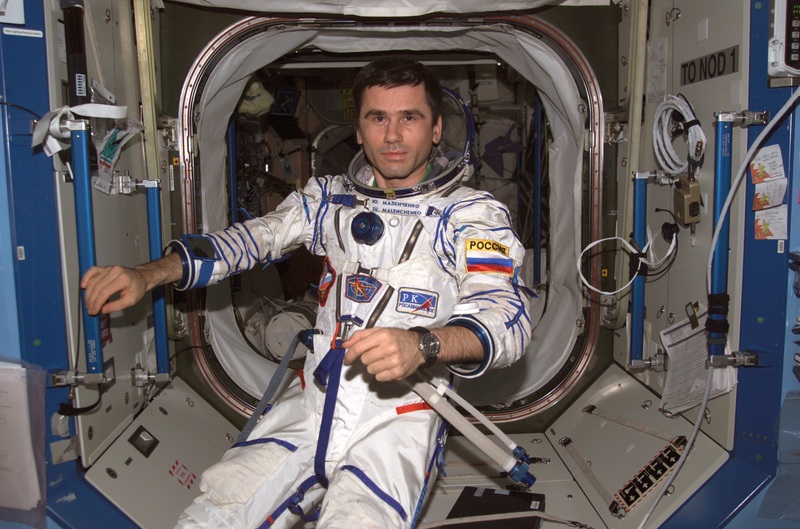 When marrying in 2003, Malenchenko became the first person to get married while in space.